Intel and Microsoft have said they will support Toshiba-led next generation DVD technology, HD DVD, over a rival Sony-led Blu-ray DVD technology. 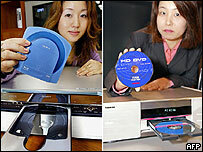 Toshiba, with NEC, Sanyo and others, is pushing HD DVD, while backers of Sony's Blu-ray discs include Dell and Apple. The support from the two biggest names in personal computing is a vote of confidence for the HD DVD group. The next generation of DVDs will be able to store much more high-quality data, including high-definition video. For months, the two groups have been battling to win support for their competing disc formats from technology companies and Hollywood studios. Future discs will be able to hold about six times as much data as current DVDs. The next generation of DVDs will be very important for studios, technology manufacturers, and the games industry. Sony has already said its PlayStation 3 games console will support Blu-ray. Microsoft has not announced specific plans about support for HD DVD playback in the Xbox 360. Films in the high-definition format are expected to be released for DVD later this year. It will be more problematic for them if there are two competing standards of high-definition DVD technology with which they will have to work. "We want to make sure that whatever is put out on the market is going to be as consumer friendly as possible from the price and usability point of view," said Blair Westlake, vice president of Microsoft's Media, Entertainment and Technology Convergence Group. Microsoft added that there were no plans to build native Windows support for Blu-ray or other HD formats, but that did not mean third parties could not build that support on their own. Intel and Microsoft were among other companies that had remained non-committal to either format for some time. "We'd been hoping the two groups would find a common format for the sake of consumers' benefit but apparently those efforts failed," said Masatoshi Mizuno, a spokesman for Intel in Japan. The two groups, the HD DVD Promotion Group and the Blu-ray Disc Association (BDA) have spent some time arguing why their technology is better than the other. At one point, there was hope that the two would collaborate on a hybrid solution, but there has been no agreement so far. Although the computing and entertainment industries are keen to avoid two formats, the computing industry has overcome such problems in the past by offering drives that can read different formats. But the industry has learned from early format wars, such as the battle between VHS and Betamax video formats, which resulted in consumer confusion and the demise of Betamax. Backers of Blu-ray technology argue it is a more sophisticated technology with a greater storage capacity. HD DVD supporters say their preferred technology will be available sooner and will be cheaper. Toshiba said it had developed the first laptop with a next-generation HD DVD drive in it. It said they would be available by the start of next year in Japan.